Today's small batch San Juan Estate Mint 70% Dark Chocolate bar (Batch 0072) was crafted by bean-to-bar maker LetterPress Chocolate LLC (Los Angeles, CA). 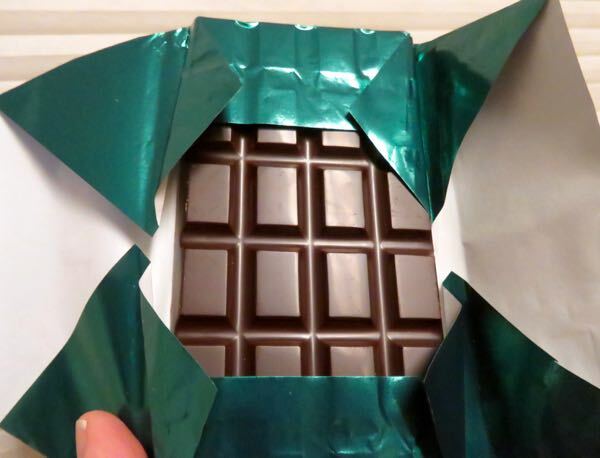 And it was another very aromatically mint dark bar. 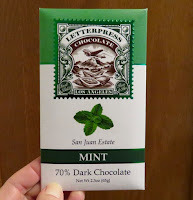 The menthol notes eclipsed the subtleties of the chocolate flavor, and gave the bar a "clean" tasting, lasting finish and conveyed more sweetness than likely was actually present in this 70% cacao bar. Tasting Notes printed on the packaging read: mint, marshmallow, vanilla. 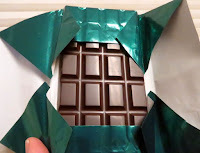 Ingredients: organic cacao beans, organic unrefined sugar, organic cocoa butter, organic mint oil. The Trinitario cacao used to make this bar was grown in the Gran Couva area of central Trinidad. * And this Trinitario cacao was "the first to be made into a single estate bar by the Valrhona Chocolate company." Careful cultivation by early chocolate makers like Valrhona has contributed to today's stock used by craft chocolate makers like LetterPress. Happily, chocolate consumers benefit from cumulative expertise and sharing of knowledge. *The Republic of Trinidad and Tobago is a two-island nation located in the southern Caribbean Sea. Three varieties of cacao dominate most of the chocolate world. This bar was made with Trinitario cacao, a hybrid of Forastero and Criollo cacao, and likely first evolved in this part of the Caribbean.